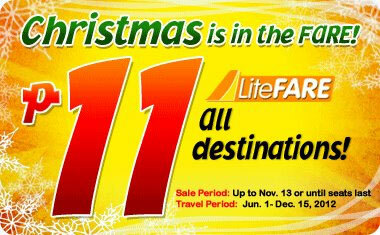 Cebu Pacific is offering an 11-peso seat sale on Nov. 13. The travel period will be between June 1 to December 15, 2012 from Manila to major domestic tourist destinations. Check out their site here and see if you can reserve one or more seats for your family and friends. Good luck! This entry was posted in Travel/Airfare promo and tagged Cebu Pacific, seat sale on November 11, 2011 by Yami.